I had seen a presentation given by a fellow photographer that inspired me to go out and shoot some wine glasses. 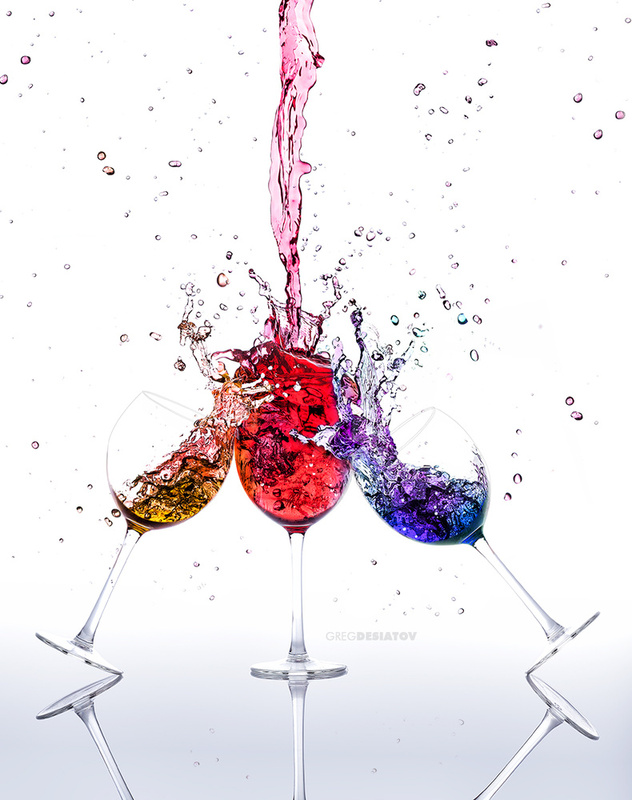 The photographer had a series of wine glasses that were tilted on an angle with a variety of coloured liquids in them. My assistant and myself setup up an area in the studio that could easily be cleaned after the mess we knew we would make. The first task was to create all the splashes of colour. Using red diluted cordial, we started capturing various versions of the cordial being poured from one clear plastic container to another in front of a huge 2.4m x 1.8m backlit scrim. We took about 30 shots of those and then started to capture a number of images where we were throwing the liquid across the view of the camera into a huge bucket. We cleared and moped up the mess and setup up a small table with a large low baking tray and a drinking glass full of red cordial. We proceeded to drop a small steel weight into the glass while capturing all the variety of splashes it created. This part of the process was really messy but we were on a concrete floor so it was very easy to clean up. Once I thought I had enough variations of splashes, we then moved onto shooting the wine glasses separately. I really wanted to get the leaning glass in camera so I could capture the reflection accurately. On so many occasions I have seen glasses on shiny surfaces that have just had the image copied, flipped and then pasted and the issue with that is, that the reflection doesn't actually meet the glass realistically, especially on a round base like a wine glass. On the same cleaned table with the same lighting, I set up a piece of gloss white acrylic to get the reflection. I then placed the wine glass in the middle and taped and edge with clear sticky tape. This allowed me to lean the glass over without the bottom of the glass slipping on the white acrylic. I then took a series of 4 images at different angles. If you have a good look at my image, you will notice that I have used 2 different leaning angles of the wine glass. The rest of the image was created in post with all the elements that I had shot. Another thing I tried to accomplish was to use primary colours and where the liquids mixed, they created the secondary colours.